CVS is also trying to buy up small pharmacies, which is much easier to do if they’re going out of business. In its greed, the company squeezed independent mum-and-pop pharmacies. The squeezing wasn’t being done by the part of CVS you buy dental floss from or visit to pick up a prescription, though it’s not unrelated. It’s a behind-the-scenes business known as a pharmacy benefit manager, which manages payments between insurers and pharmacies and drug companies. The mum-and-pop pharmacies say CVS’ in-house pharmacy benefit manager, CVS Caremark, slashed reimbursements for medications sold to their patients on Medicaid. At the same time, they say, it was reimbursing CVS pharmacies at much better rates. With some of them on the verge of going out of business, these pharmacies have rallied lawmakers – both Democrats and Republicans – to put an end to this. So now CVS faces a tide of resistance to the way it deals with smaller rivals. Already, Arkansas legislators have passed a law aimed at curbing this behaviour. This is new regulation in a Republican-dominated state. That’s how bad things looked to the lawmakers. Ohio is forcing PBMs to disclose more about the way their pricing and contracts work. Mum-and-pop pharmacists in states like Texas and Kentucky are realising they have a CVS problem on their hands too. Caremark manages payment for Medicaid-managed care plans in more than 20 states. This is important because CVS is trying to cut a $US68 billion deal to buy a health insurer, Aetna – a deal that would make it even more powerful and more able to obscure the whys and hows of pricing all through the healthcare system. What’s more, CVS isn’t the only healthcare company trying to turn into a leviathan. 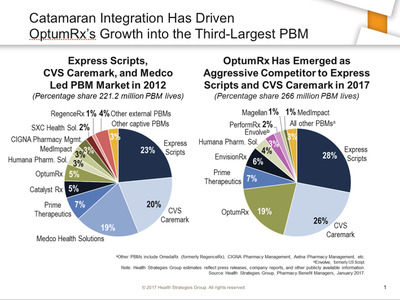 Over the past few years the largest healthcare companies – including insurers, PBMs, hospitals, and drug companies – have been combining in what is known as vertical integration, or mergers between companies in the same industry whose businesses don’t directly compete. The state legislature nearly unanimously passed a bill designed to curb this behaviour from PBMs on March 14. The situation had gotten desperate, fast. The way mum-and-pop pharmacists tell it, CVS started bringing the pain at the beginning of 2018. Suddenly, reimbursement rates for Medicaid plummeted at the same time drug prices for Medicaid started rising. So in the beginning of February, Arkansas Attorney General Leslie Rutledge started investigating the matter. “The amount paid to the pharmacy was less than half of what was being charged to the plans,” Scott Pace, of the Arkansas Pharmacists Association, told Business Insider. For a Fentanyl Patch 100, CVS pharmacies were reimbursed $US400.65 while mum-and-pop pharmacies were reimbursed $US75.74. For Amoxicillin, CVS pharmacies were reimbursed $US35.92 while mum-and-pop pharmacies were reimbursed $US12.21. For even something as simple as Ibuprofen, CVS pharmacies were reimbursed $US5.86 while mum-and-pop pharmacies were reimbursed $US1.39. Sometimes, the pharmacists say, they weren’t reimbursed enough to cover the cost of filling the prescription. These aren’t the only ones, to be clear. Business Insider has seen a long list of alleged disparities like the ones above. CVS, for its part, denies that it is squeezing the mum and pops. Business Insider sent the above examples to the company, and its spokeswoman Christine Cramer said they were patently wrong. However, she also said the pharmacists were “cherry-picking” reimbursements that look especially bad. “The facts are that on an aggregate basis, we reimburse independent pharmacies at a higher rate than larger regional and national chains,” she said. Out of a $US50 drug, for example, say $US22 was paid to the mum and pop, the rest went to CVS – to its PBM. At the same time, patients looking at how much a drug cost their health plan in their explanation-of-benefits portal would show a price of, say, $US100. “The numbers were stark,” Pace said. Business InsiderHere’s the letter pharmacists are getting, urging them to sell their businesses to CVS. So until this was all figured out, people who bought medicines at their local pharmacies in Arkansas (and Ohio) didn’t know that their neighbours were getting screwed. 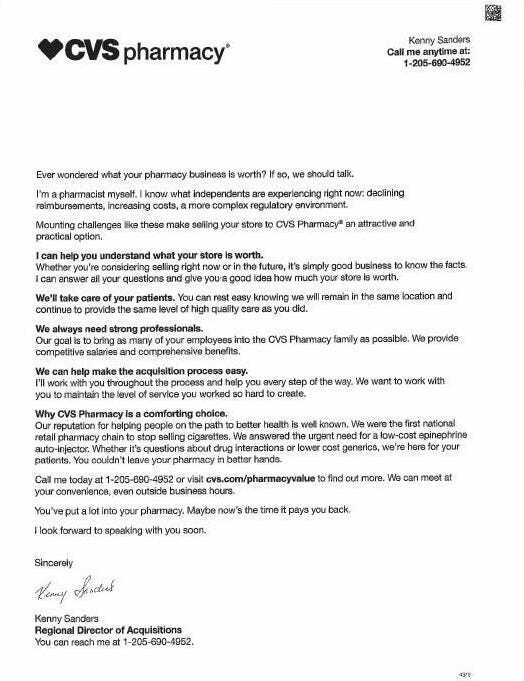 They also didn’t know that, as their local pharmacists were getting squeezed, CVS was waiting in the wings, sending out letters offering to buy the very mum-and-pop shops it was forcing out of business. One pharmacist, Rick Pennington of Lonoke, Arkansas, said that if it weren’t for his business mailing a generic erectile-dysfunction pill to nine states, he’d be out of business. The story for pharmacists in Ohio is a bit different. There, some have viewed CVS as problematic for years, but instead of seeing reimbursement rates plunge, legislators and pharmacists said they have been moving up and down like crazy since around 2015. By October or November of last year, gross annual margins for Medicaid payments to mum and pops were going below zero, and pharmacists were losing money on most drugs sold. And of course, CVS sent those letters soliciting acquisitions. One came on November 9 of last year, a particularly bad time for the state’s mum-and-pop pharmacists. Suddenly, the number of people in Ohio government demanding answers, led by Ohio Speaker Cliff Rosenberger, started to multiply. They realised that the Ohio Department of Medicaid wasn’t even asking for the right pricing data, and CVS had never considered giving it to them. Now, as rules change within the department, it will have to. Brad Miller, Rosenberger’s press secretary, said this was something his boss had been looking into for years. Ciaccia told Business Insider that during the three years CVS has been engaging in this behaviour it has gained 68 pharmacies in the state. Its competitor Walgreens added only two locations over the same period. PBMs have all sorts of tricks up their sleeves to make money not just from pharmacists but also from insurers and drug companies – basically anyone involved in getting medicine to you. They can make money (as we’ve seen here) off the spread between what they pay pharmacists and what they charge your insurance plan. They get reimbursements from pharmaceutical companies. The fatter the rebate, the more likely they will include a company’s drug in a client’s (your) managed-care plan, but they don’t have to share that reimbursement with the client (you). They can keep some and negotiate rebates for themselves. They can collect all kinds of administrative fees and other types of fees from drug companies too. We’ve been learning about this slowly. 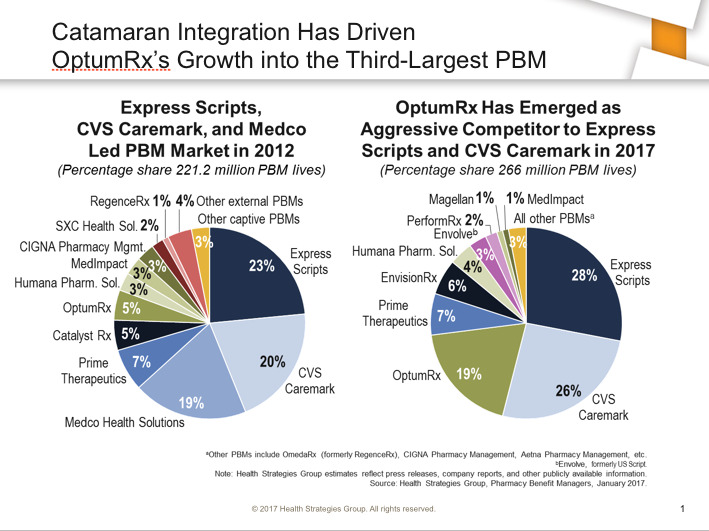 Three PBMs – CVS Caremark, Express Scripts, and UnitedHealth Group – control about 70% of the US market, and they guard their secrets zealously. Recently, though, the news site Axios published a contract template for Express Scripts. No two contracts are alike, and Express Scripts grumbled that the one Axios published (which was rife with loopholes to make Express Scripts money at every turn) was old and irrelevant. This “Oh it doesn’t matter to our business – but DON’T TOUCH THAT!” response is trending in PBM world. For example, earlier this month the US Senate introduced the Patient Right to Know Drug Prices Act, which would ban the so-called gag clauses mentioned above (as Arkansas lawmakers did in their bill). Sounds as if they’re for it, right? Wrong. Here’s the next sentence. C-Span, screenshotRep. Earl ‘Buddy’ Carter of Georgia. So which is it, guys? Do you think transparency is important and support patient rights – or are you going to fight this bill? It’s a simple question. And it’s easy to see the answer. Rep. 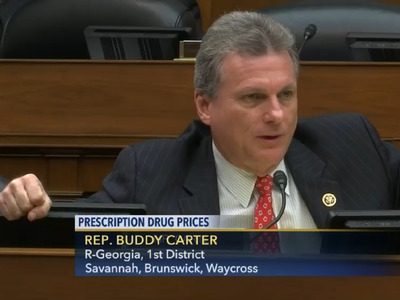 Buddy Carter, a Georgia Republican, introduced the Prescription Transparency Act to the US House of Representatives this month. It does basically the same thing as the Senate bill, and, as the only pharmacist in Congress, he knows he’s facing a street fight from the PBM lobby. If you believe that, you should also believe taking that control won’t be easy. Once we do, though, it may change the way you look at what our healthcare is trying to become.